as for bottomer (quarries) (072). breaks clay up into small pieces and feeds them into circular tank to be mixed with water, forming creamy mixture called "slurry." breaks down large quantities of chalk from quarry face by blasting. gets out from sides of pit clay and sand, which is then washed to bottom of pit by stream of water. a quarrier q.v. getting clay. feeds and attends to crushing machine in which large pieces of chalk, clay, etc., are broken up. digs chalk, clay, flint, sand or gravel, with pick and shovel. (ii) a man prospecting for "coprolite." digs for fossils in chalk, etc., with pick and shovel. (iii) inspects working places and travelling roads and makes them ready for workers. as for horse driver (072). see digger (chalk, clay, flint, marl). greases axles of wagons, and does general odd jobs in quarries. removes top flints from loaded chalk wagons. sorts fossils taken out of mines, pits or quarries according to kinds. digs "gault," a kind of marl, at foot of chalk strata with pick and shovel and loads into trucks. (ii) (mines) miner (fuller's earth) ; picks out fuller's earth or stone from overlaying strata of coal seam with pick and bar; shovels into tubs for conveyance to crushing machinery; used for dusting mine to render coal dust less inflammable. gets gravel from river or sea bed by "placer" mining method or by alluvial mining, generally with a digging line of buckets, worked by steam engine. (ii) (quarry sand) controls levers of grinding machine for grinding sandstone, gravel or other stone, or clay; shovels and throws sand and lumps into feed hopper, when this is not automatically fed by chute or conveyor. Northamptonshire, Cambridgeshire, and Huntingdonshire term for clay, quarry or pit worker q.v. digs sand or gravel for ballast with pick and shovel, loads it into trucks, etc. ; washes material to remove impurities; sometimes also sifts or screens it. general term for any unskilled worker employed in or about pit, mine, or quarry, loading, digging, wheeling, etc. gets fireclay from coal or fireclay mines in manner similar to coal mining, see hewer (042), coal cutting machine driver (042); blows down with explosive, picks and bars down, cuts by machine, etc., according to circumstances; fireclay occurs interstratified with coal. gets material out after miner or getter q.v. has won it, i.e., lifts throws or shovels material into trucks, pushes trucks to siding, may Split large blocks or lumps with wedge and hammer. attends to pumps by which china clay in suspension in water is pumped up from mines or quarries; also attends to shafts up which clay is pumped; keeps valves of pumps clear and in good order. gets material from pit or quarry face by pick and shovel, or by blasting; if explosive is used, bores hole, tamps down charge and, after explosion, brings down loosened material with picks; sometimes also loads into trucks. removes topsoil ("overburden") with pick and shovel, and washes out china clay by letting streams of water flow down face of quarry, producing solution of milky consistency. gets china stone by drilling with hand or machine drill, or by blasting. 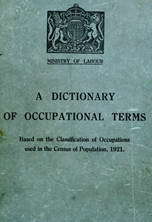 general term for workers employed as getters, labourers q.v. or in any other capacity in clay, marl or other pits. riddles, or sifts, sand or gravel by shovelling it against fine-meshed sloping sieve, sometimes called a "grizzly," to separate gravel, clay, stones and other coarse material, sometimes further designated according to material worked m, e.g., sand riddler, gravel screener. runs trams or wagons; from quarry face to bottom of incline. digs out sand which settles at bottom of "slurry" tanks and shovels into barrows; wheels barrows to tip. removes overburden with pick and shovel; drives in crow bar or wedge and shears out face of marl or clay quarry, to be shovelled away. dirt picker, picker, picker on bank, selector; examines clay, especially fireclay, as it comes from pit or quarry and picks out impurities, such as stones, nodules of iron pyrites, pieces of wood, etc. ; cf. clay dresser. operates tipping lever to tip contents of wagons, tubs, bogies, etc., at crusher hopper, railway trucks, dump, etc. cleans gravel by washing, usually in machine; shovels gravel into machine, where gravel is not fed by hopper or conveyor; controls water supply and operates machine. washes china clay out of vein in pit by drenching clay with water so that a "slurry" or paste is produced, which can be pumped or run into settling tanks. (ii) wheels clay in barrows, etc. ; (ii) see braker.